If South African wildlife is not thrilling enough for you, imagine riding this BMW R100RT Desert sled in the Kalahari Desert at sunrise. It’s not just my wild imagination this was a reality during the annual Kalahari Speed Week. Los Muertos Motorcycles is located in Cape Town, South Africa and was established almost 2 years ago by Craig Wessels. His passion has been about all things petrol for as long as he can remember. Combining his creative talents under one roof, the bike and coffee shop, fronts Los Muertos Film Production, housed directly behind a very well laid out space filled with classic memorabilia he has been collecting over the years. Front man and manager, Steven Pitt runs the whole bike side, and is the guy to speak to about commissioning a build or anything else biking related. LMMC tells us ” Our philosophy on bike builds is always to make the bike better, but be very aesthetically driven. We try to always reference South African culture as a center point of each bike; drawing from the very diverse influence history has had on our country. Hence the Afrikaans or Xhosa names we give to the bikes. Being all the way down here at the tip of Africa, we believe that this approach is a contributing factor to how we can differentiate ourselves from everyone else. After all, bikes have a soul, why not give each one a personality as well. Our vision was to build an angry sounding Desert sled styled Beemer, for our annual trip up to The Kalahari Speed week, where our video was filmed. But, also something equally at home in and around Cape Town City. 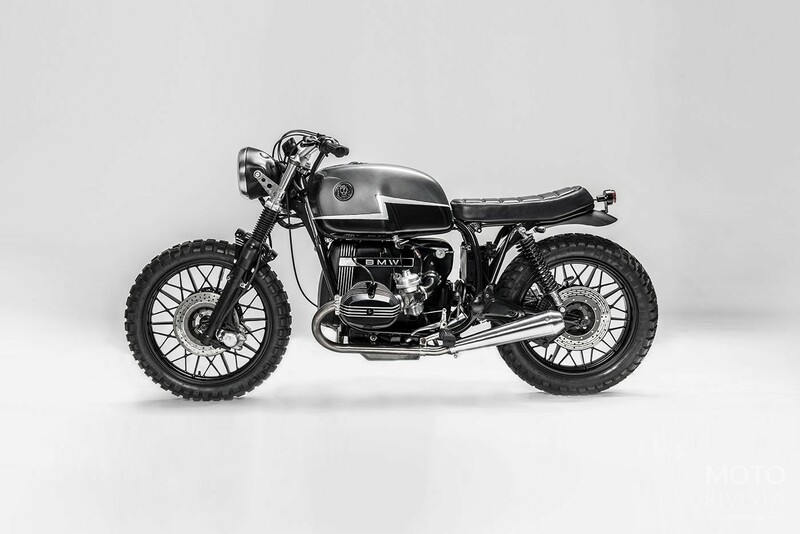 This Beemer named “Bosbefok” is based on a 1979 BMW R100RT. The first thing we did was remove the over sized standard fairing, which this model came with. The sub frame was chopped, and a new shorter flat loop added and a new seat upholstered. The original rear fender was also modified and chopped to be shorter. New indicators and a back-light were fitted. The original rims were sprayed black, new dual purpose TKC 80 rubber on the front and a Metzler Enduro at the rear. The frame has also been powder coated black. The tank was re coated inside and illustrated by hand, in house by one of our crew, Gavin Coetzee, then clear coated in high gloss. 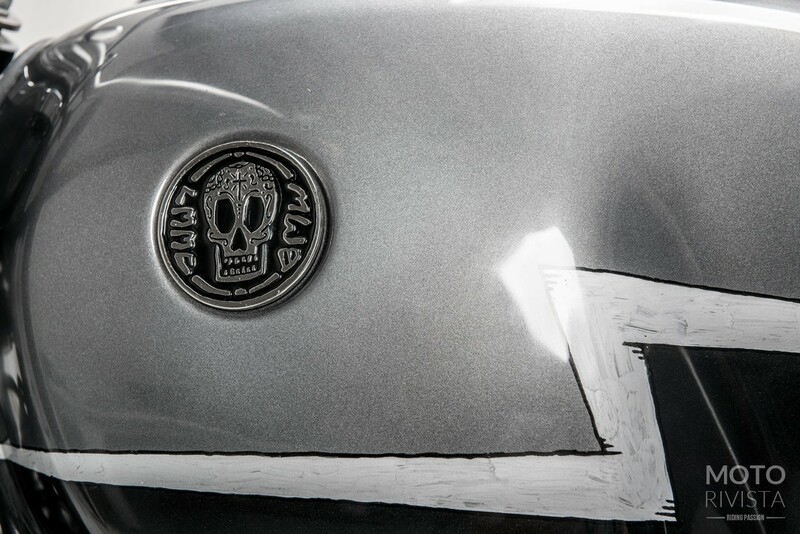 The tank badge was also designed by Gavin and then manufactured from cast iron and reads LMMC (Los Muertos Motorcycles) with a version of our sugar skull. The engine was finished in black. All the chrome bits were brushed as well as the reverse cone shorty mufflers. Does this BMW R100RT Desert sled make you want to jump on a plane and get yourself to The Kalahari Desert Speed Week next month? The bulky stock BMW R100RT with all it's over sized standard fairing would be no match for the expectations at the Kalahari Desert Speed week. 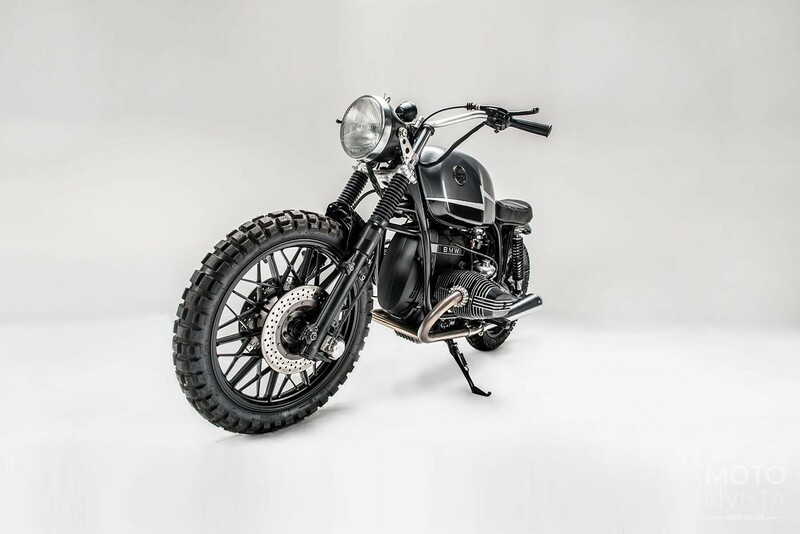 This BMW R100RT Desert sled drops the unnecessary and enhances the necessary. The tank forms great lines with the modified frame and the seat. The final result is a well balanced and cleverly executed Beemer from LMMC.